We're in a time where traditions are being challenged and remixed. We question how they came to be and the context in how (or if) they fit into the future. Jim Gray Think big. Start small. Move Swiftly. Luiza Arcuschin Traditions are made by us, for us! Think about the ways that the holiday food traditions do impact you. How does it connect you to your past, to your family’s heritage, to your culture? What memories are triggered by those smells and the visuals and the taste of the holiday food? I believe every dish tells a story. Sometimes food is not about a personal thing—it’s creating that memory for somebody else. Cooking is a sensory experience and those memories can be very vivid, depending on what you’re connecting to. Cheese has been with us since we started being human... and these traditions just might be able to help us carry on and achieve balance in a highly uncertain future. Tradition can also be grounding, it can remind us where we come from. And where we want to go. Face to face interactions have never been more important. Even though I'm working with completely different demographics and stages in life, they all feel the benefits [of singing]. We sing at the big moments in life. Nebojte se založit si vlastní tradici, ať už bude jakkoliv bláznivá. Nebojte se dát své děti na řemeslo, budou se mít dobře. Aby tradiční značka přežila, je pro ni důležité, aby byla schopna inovovat. Don’t worry about the believability of your stories. The reader will believe everything you want them to. The only thing you have to make sure is that you create a character with which the reader can empathise. They have to see and recognise something of themselves in the characters. By reading we will develop our imagination which means that we will also increase our empathy levels. And neuroscientists actually found out that when you read fiction you will get this immediate boost of empathy. One night I thought my life would be very different if I was just like Pippi Longstocking. And then I thought what if every time I am anxious or scared to walk up to other kids I just imagined that I was Pippi Longstocking? Toute ma vie, j'ai rêvé d'un théâtre qui n'existait nulle part autour de moi. Think deeply about how people will consume your art, and take care to make their experience as full and lasting as possible. By creating work with the intention of generosity and then setting it free, I found that generosity can be a medium—a lot like color. It's important to respect tradition and to challenge it as well. I think of entrepreneurs as people that do two things. One, they solve problems creatively; and two, they seize opportunities. That's what I try to do in my role as mayor. What we really need to do is share our traditions, because by sharing our traditions we could prevent these unshakeable extreme views of people, because we get to know each other. We all get a greater sense of understanding of who we are and who our neighbours are and instead of living in fear we're able to accept them and even adopt some of their traditions as our own. When somebody learns their tribe's traditions they are given that sense of belonging. 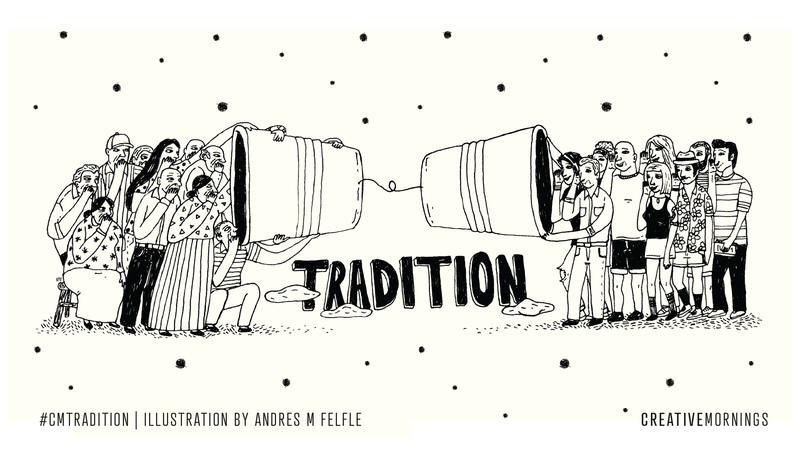 Traditions give us a sense of identity and identity is what helps us define our tribe. Tha's what makes us feel good and gives us the strength to survive. Which traditions in your life inspire joy and connection? We bridge tradition and creativity with intention. Creativity is thinking outside the box. It’s coming up with something that matters for you. Creativity is doing something new and different. December 14 Jimmy Herdberg - Let's disrupt the fashion industry! December 15 Nicoleta Hritcu on "Tradition"